Echipa AVmall incearca sa mentina acuratetea informatiilor din acesta prezentare. Cu toate acestea, in anumite cazuri, pot aparea mici inadvertente pentru a caror semnalare va suntem recunoscatori. Ne poti contacta oricand pentru a clarifica eventuale nelamuriri. Nu uita sa mentionezi in corespondenta ta numele exact al produsul. Fotografia produsului Produs Antivibratie fo.Q AB-70 are caracter informativ si poate sa difere de produsul real sau sa contina accesorii neincluse in pachetul standard al produsului. Specificatiile tehnice pot contine erori de operare si pot fi schimbate fara instiintare prealabila de catre producator, neconstituind obligativitate contractuala. The AB-70 audio board features a multi-layer structure that is a composite of polymer hybrid adhesive damping sheets and two types of advanced hybrid ceramics. The use of multiple layers of different materials ensures that the board produces highly realistic sound, while the elimination of characteristic sounds makes it possible to express the subtly different tone colors of each instrument. 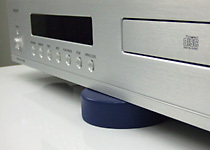 The board effectively suppresses tiny unnecessary vibrations in audio and visual equipment, as well as external vibrations, so that it can be used not only as a base for amplifiers, CD, DVD and record players, projectors, and a wide range of other audiovisual equipment, regardless of size, but also as a base for speakers. It can be installed with either three or four points of contact with the floor, to accommodate individual preferences. The surface has a paint finish, so using the product as a spike base, dragging it from one location to another, or bringing it in contact with a hard object could scratch the finish. The product should be handled very carefully. The adhesive damping spacers provided as an accessory can be affixed to the tops and bottoms of the blocks, to adjust the sound to the desired level of vibration. These adhesive damping spacers also serve to keep the blocks from slipping. Nu sunt recenzii pentru Produs Antivibratie fo.Q AB-70. Fii primul care scrie una!